Since the beginning Buddhism been in a constant dialogue with other religious traditions, which has been tolerant to some extent, but also critical and polemical. Buddhists have used parody, satire, re-contextulisation, as well as outright condemnation when the need arose. There is some really very biting parody of Brahmins in the Pali Canon, some very funny jokes at their expense! Sangharakshita is sometimes criticised, in a kind of weird reversal, for being critical of other Buddhists and expecially of Christians. It's as though we Buddhists have forgotten our own history and are buying into a modern myth which is telling us that all religion is ok, and not to rock the boat. However our own scriptures give the lie to that naive notion. Buddhism is and always has been quite a militant critic of unbelievers, and even of lax believers. However Buddhism also has the interesting tactic of syncretising with indigenous beliefs. In China it bred with Taoism especially. Confucianists remained quite hostile because Buddhism appeared to deny filial piety - no family values for us! In Japan Buddhism formed an interesting syncretism with Shinto resulting in the identification of the Sun Goddess, Amaterasu, with the Great Sun Buddha, Vairocana. In Tibet there was Bon and the synthesis of Buddhism and Bon has been a very dynamic hybrid indeed. However in India there were a number of major faiths with which Buddhism interacted and syncretised. Firstly there was the Vedic religion which gave us such concepts as Brahma Vihara, and Going for Refuge. More crucially there was the later interaction with Puranic Hinduism - and especially with the worship of Siva. Siva had gone through a long process of being absorbed into mainstream Indian faith through being identified with the Vedic Rudra. This was a bit of a stretch to be honest, but the Brahmins were very good at this sort of thing, offering to make the preists of competing cults into honorary Brahmins for instance. In the Mahayana Karandavyuha Sutra we see Siva being gently converted into a Buddhist, just as Brahma and Indra were in the Pali Texts. But in the Sarvatathagata-tattvasamgraha Tantra the action has been stepped up a notch. This time Siva refuses to submit, and Vajrapani kills him and tramples on his body (which is what we see in the depictions of Vajrapani). He brings him back to life however and converts him to Buddhism - both the killing and ressurection are accomplished with mantras. But here's something interesting: I was searching around for a pic of Vajrapani doing a two-step on old Siva and his wife, and it took some time. In a lot of images they are left out and Vajrapani is just dancing around on his own - which doesn't make a lot of sense and ignores the context for him being wrathful and stomping in the first place. 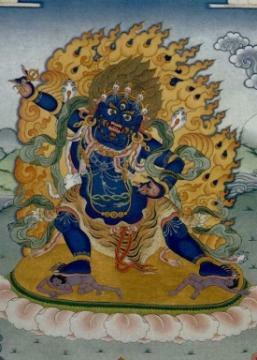 An important function of Vajrapani was (right back in the Pali texts) and is (in the Tantras) the thumping of people who fail to pay homage to the Buddha. Has Vajrapani been sanitised for public consumption I wonder? We will probably never see a depiction Jesus being trampled by Vajrapani the way that Siva is because, at the time and place the Vajrayana was emerging, Siva worship was the prevailing religion, and it was a vigorous living force and a threat to Buddhism. Christianity has been in a slow decline for centuries now, and although western culture is nominally Christian, the evidence is that it is dying. The Pope (take your pick) will occasionally say something along the lines that although Buddhism has some good points it really is a failure because it is humanist, but it's like being savaged by rabbit. And the Dalai Lama is also titled His Holiness these days. In any case Christianity is fighting on many fronts. With militant Islam constantly in the news, basic Christian values being undermined, not to mention in-fighting and schism over the status of women and homosexuals; the Christian clergy really don't see Buddhism as a problem - we smile a lot and so they think we're harmless. Tee hee. I don't see much on offer from theology generally which which to syncretise in the West. Philosophy does seem to have some promise, but I'm not well versed enough to know how things might mix and match. I think the '-ology' which provides the richest pickings for a syncretism in the west is not theology, but psychology - especially depth psychology which had its beginnings with Carl Jung, and which sees psychology as a manifestation of archetypes of a deeper layer of reality. It is said that Jung was strongly influenced by Eastern religion, and by Tibetan Buddhism in particular. So perhaps the syncretism has already begun. Perhaps we will see Freud and Jung being trampled by Vajrapani sometime soon in a Tantra near you. Now that might be interesting.